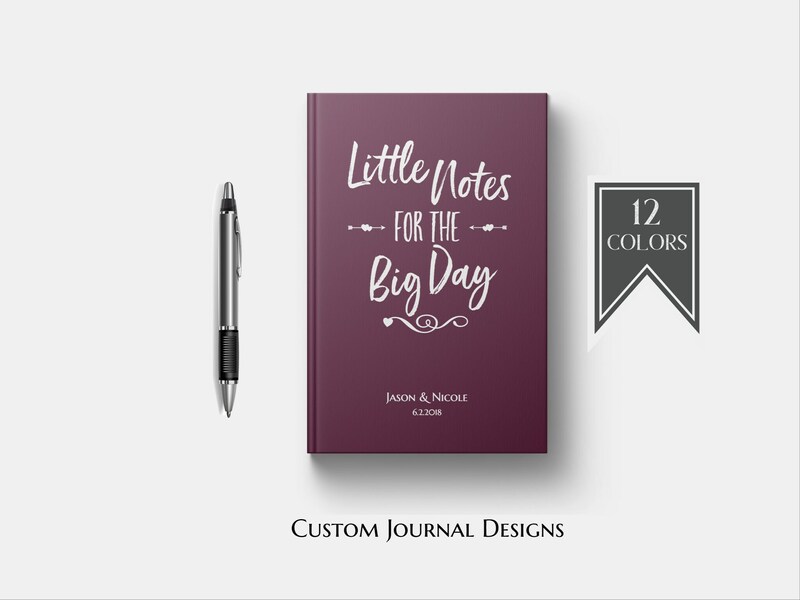 The perfect PERSONALIZED "Little Notes for the Big Day" Wedding Planning Blank Journal Notebook! Customize the cover with the couples names and wedding date (optional). Simply leave a note at check out with the names of the couple and the dates you would like on your journal cover. If you’re looking to get excited about the Big Day, this blank lined wedding planning journal notebook makes the perfect wedding keepsake gift for the busy bride or mother of the bride to keep notes and to do lists at hand! For family members or maids looking to surprise the bride-to-be, or if you’re the one getting married and are looking to jot down thoughts, scribble notes and ideas, "Little Notes for the Big Day" will be cherished long after the day has gone and makes a great gift for grooms as well. This blank lined notebook features the words "Little Notes for the Big Day" on the cover and plenty of room write special keepsake letters and wedding details in honor of this special time. This Wedding notes journal book comes with lined pages and makes the perfect gift idea for an engagement gift or bridal shower gift for the bride to be that's tying the knot, and can be used to to write down all of the bride-to-be’s wedding notes, plans and ideas as you plan your special wedding day. • Features the words "Little Notes for the Big Day" on the gorgeously designed cover. Or choose another color of your choice. Little Notes for the Big Day Custom Notebook. Personalized Wedding Planner Memory Book. Engagement Gift for Bride to Be. Bridal Shower Gift.